In the last few years, because of the better catalytic ability of heterojunction catalysts than that of single-component catalysts, more and more attention has been paid on the research of heterojunction catalysts. Various types of heterojunction catalysts have been reported like Bi2O3/Bi2WO6, WO3/BiVO4, SnO2/TiO2, CdS/TiO2, g-C3N4/TiO2, and Ta3N5/Pt/IrO2. Among them, the heterojunction catalyst g-C3N4/TiO2 has been researched tremendously recently because of its high activity, high thermal and chemical stability, and well-matched energy structure. Many approaches have been developed for its synthesis, such as hydrothermal growth of TiO2 on g-C3N4, ball milling of g-C3N4 and TiO2, and so on. In this chapter, the recent researches on the synthesis of g-C3N4/TiO2 catalyst were summarized. 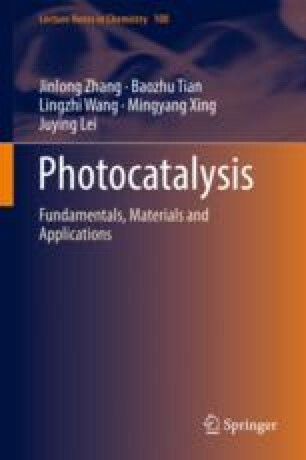 In addition, the applications of g-C3N4/TiO2 catalyst in the field of photocatalysis were introduced in detail.